I believe you could even make a pixel display with a double sided board where pixels would be vias.Then on one side would connect rows and the other side the columns,instant EL pixel display although low resolution.Plus no conductive paint required! The brightness is proportionate to the rate of change of the electric field. By using two parallel plates in the capacitor that is the EL display (where the outside one is transparent), you can get a sufficiently high V/m without needing a even scarier high voltage supply. Also, getting uniform brightness with a transverse field is probably harder. Homemade EL monitors are just around the corner? Dude. Screw pixels! Just combine this with some of the pcb designs here! http://boldport.blogspot.co.uk/ Multiple layers of vines and colors that change depending on the circuit’s state. Debugging circuits could be made fun AND aesthetic! How thick/thickenable are these inks? This would be awesome in conjunction with screen printing techniques. Does it come in different colors? If this could be applied with brushes in a variety of colors onto bare copper… wow! The inks are designed to be screen-printed (it’s the normal way of making EL displays). ether acetate for the phosphor and dielectric inks, benzyl alcohol for the translucent conductor). I’ve found that denatured alcohol works OK for thinning the translucent conductor, but I haven’t found a commonly-available solvent that works with the other inks. I want to see someone make an RGB EL display, with a high enough resolution to play recognizable video. Then the really slick trick would be to apply such a display directly to something like the hood of a car. Could this be done with the fluorescent coating from inside light tubes suspended in a conductive ink and some suitable dielectric material? Just for when you have to be really budget. Also if you reverse this process and use a bare copper plate with the dielectric exposed could you draw on it capacitively with fingers and stuff? Like a slow fade etch-a-sketch? The voltage (and resulting current) necessary to get it to light up might not be a good thing to touch. Also, it would probably fade pretty quickly. If your PCB fab supports silkscreen (usually used for labeling things), could you cover the entire board in silkscreen, except for the common electrode, and then skip the dielectric layer? 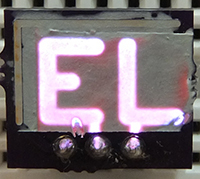 You would need to use soldermask rather than silkscreen (silkcreen doesn’t stick to bare copper), but it can be done. The downside is that the EL display is less bright. The dielectric makes the display brighter by increasing the energy stored in the EL capacitor. Any chance you could add some pictures/more info about the 4×4 pixel array board? I’m interested to see how well that works and how you are controlling it (it looks like grounding strips for each column and then power for each row on the back). Great project and a neat kit. The full filled silk screen would stick on top of the solder resist layer just like most of the cool kids layout these days. I can see this as an interesting way of making conference badges. Laminate a non-populated PCB with the EL stuff applied (to protect it and user) and after that cut off port of the plastic to solder in driver circuits and add battery. Awesome. It’s also really nice that he’s thought to provide kits for anyone to try it out. I’m sure it’s as much to cover his costs as to help people out, but great all the same. What about longevity? EL wire has barely a 500 hour lifetime and it loses 50% of it’s brightness in the first 10 hours. does this stuff have any real life to it? … depends on how hard you drive it. run it at 500% like most people and it’ll last days/hours. it will die much earlier then expected. Interesting, this explains a lot of the problems I had with EL. Also relevant, Supertex do a surface mountable chip scale EL driver without external parts so an active matrix display is feasible with one of these for each row and MPSA42 as the individual pixel drivers. An interesting note, there is another way to make transparent EL which is to vacuum deposit Al onto a sheet of glass, electroporate it with boric acid and then lay down phosphor paint and other layers as needed. I think the commercial displays use coloured filters but there are now direct emission phosphors in the orange and green/blue variable frequency range so some clever signal switching would yield an approximation of full colour good enough for most applications. I think most commercial displays that look remotely like this use VFDs, not EL… same color properties, less impact resistant, lower voltage, many thousands of hours longer life. Also interesting is the use of high voltage DC (below Vbreakdown) to form the layers, which substantially increases brightness by aligning the phosphor and dielectric particles within the carrier liquid before it is completely set. Seems that part of the limited brightness issue is that even with a thin layer the capacitor needs this formation or the current path becomes too long. Animated EL panels are banned in Nevada and other several other states from operating on commercial vehicles like Taxis and buses because they are a driving hazard. They can operate while parked such as a food concession truck. If you had a video screen on a car, it would probably eventually be banned as well for the same reason you can’t watch a video on your smart phone while driving. I work for a commercial EL panel manufacturer and we already have high resolution EL panels using lasers to manufacture panels.